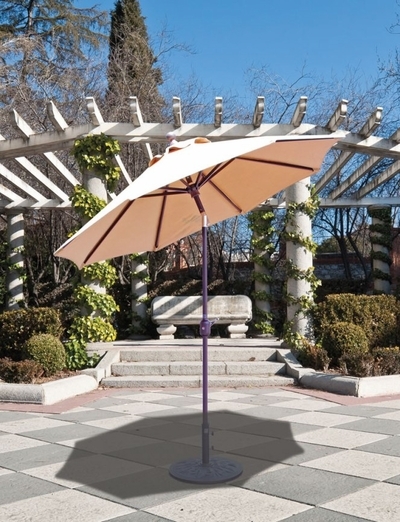 The Galtech 7.5' ft. Deluxe Auto Tilt Patio Umbrella features deluxe auto tilt and a wide range of pole and shade color choices for the perfect match. This crank lift umbrella features a built-in locking mechanism that secures the umbrella in the tilted position. When open, keep turning the crank to tilt the canopy. The metal crank housing is powder-coated to match each frame finish providing an attractive backdrop to the pole. Canopy choices come in premium Sunbrella and Suncrylic fade-resistant fabrics ensuring their beauty year after year. This season, put a little shade on your gathering and take a break from the harsh sun and enjoy!